A diversity of rosé styles exists through out the world. They’re made from a variety of grapes in a rainbow of shades and styles. Rosé comes in mass-produced and boutique quantities, the later of which are more difficult to find. Both are good, but it’s the obscure rosé that excites me. When a decision is made to make rosé, grapevines are planted in a location and farmed for rosé. Along with this choice there are other location considerations: altitude, site exposure and soils. When harvested, the grapes are directly pressed and all the juice is used to produce the wine. The saignée method is different; grapes are grown for red wine. When crushed, a bit of juice is drained off in the process. That juice makes rosé. While this sounds simple, it requires important decisions too. Both methods can produce great rosé, and both can produce bathwater. How a rosé ends up tasting depends a lot on the producer in terms of quality and style. And also the grapes. For example, a rosé from Provence commonly made with some blend of varieties – Grenache, Cinsault, Syrah, Mouvedré, Tibouren and Carignan – tastes different than rosé from Bordeaux where Merlot, Cabernet Sauvignon, Cabernet Franc, Carménère and Petit Verdot are used. 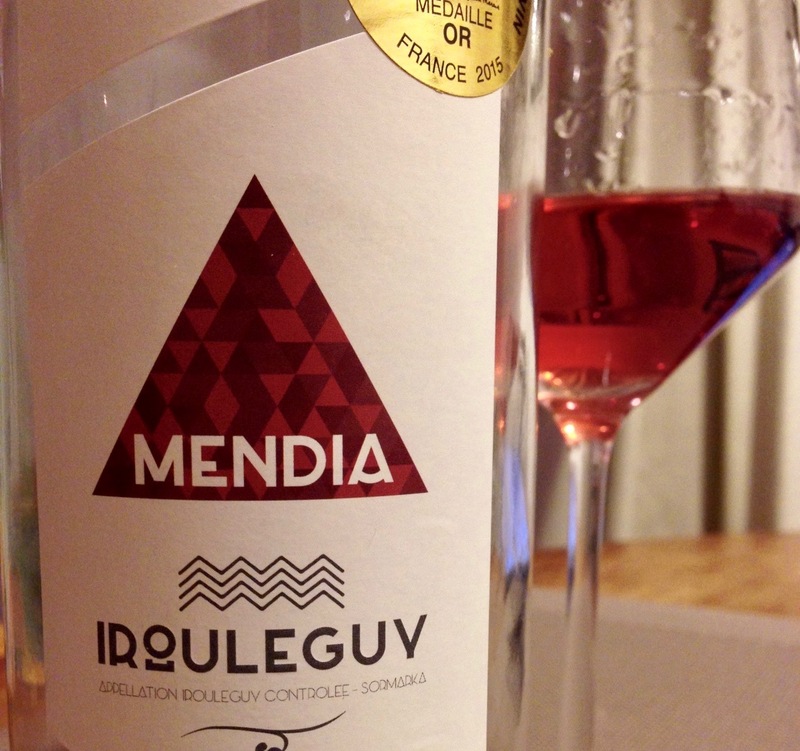 And that’s different from the French Basque area Irouleguy where rosé is made mainly of Tannat and both Cabernets. Yes grapes differentiate the wine but also elements of an area like vegetation, geography, climatic influences and people. What this means for consumers is an ocean of possibilities to discover your favorites. 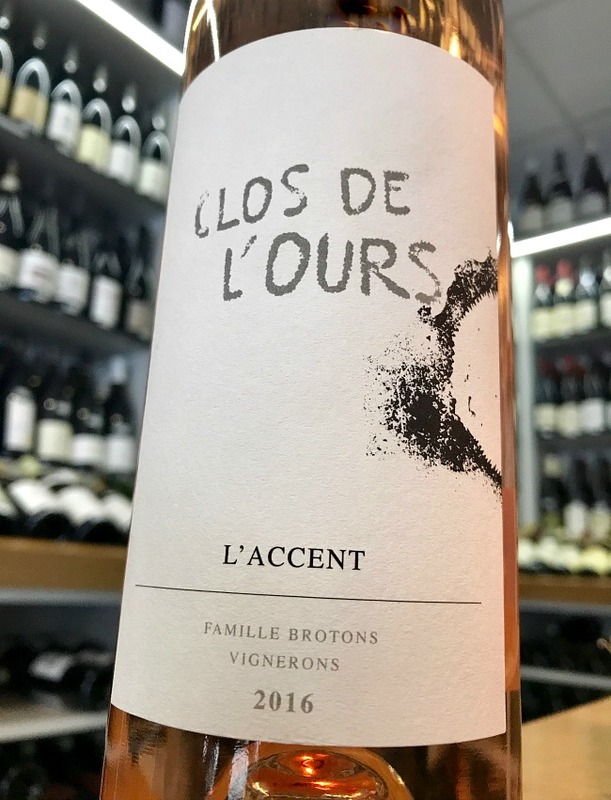 From the cooperative Cave d’Irouléguy known as “Les Vignerons Pays Basque” – raspberry and blackberry with spicy freshness and faint tannins on this earthy, fruity rosé from Irouléguy in southwest France. Made from Tannat and Cabernet Sauvignon. If you want to dig beyond the surface, here are a few to try. 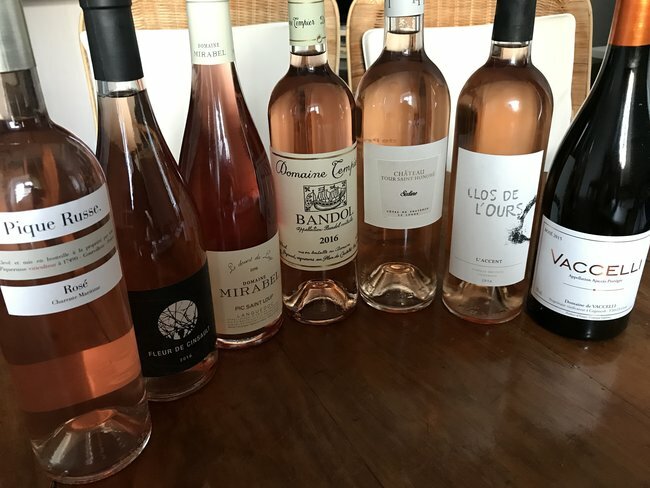 Thankfully in the US, importers like Coeur Wine Co., Zev Rovine Selections, and The Source Imports are making it easier to find different, lesser-known rosé by seeking them from smaller producers. Kermit Lynch too; he’s not small anymore but does have an amazing portfolio. Just need to say I’m excited about these two and their wines! Chloé Barthet and Frédéric Almazur started this 5-hectare estate in the Faugères appellation of Languedoc-Roussillon 3 ½ years ago. Wine is made in the vineyard for this couple. They choose preserving the soil’s life and promoting biodiversity by farming organically (biodynamic by the 2018 harvest). A variety of natural grasses grow between vine rows throughout 80% of their vineyards. Hands do most vineyard work! This past year essential orange oil was carefully used to dry mildew in vines. Caution is taken as it can be harmful to bees. In the winery they’re preserving what the grapes offer, wanting to obtain a balance of terroir expression. The Grenache, Mourvedré and Cinsault grapes for the rosé go straight to the ‘horizontal pneumatic’ press then into stainless vats. Grenache clusters for their primary red wine are pressed of which 20% is drained off (saignée) and added to the stainless vat with the other Grenache, Mourvedré and Cinsault juice. They ferment using indigenous yeasts and minimal intervention. Just prior to harvest, Chloé picks grapes specifically for fermentation purposes. She stomps them, heats them to 25 celcius until fermentation starts and lets the mixture go until fermentation is well underway. She adds them to the juice mixture in vat to start fermentation. Once complete the juice is aged on lees in refrigerated stainless vats below 17 celcius for 4-months. 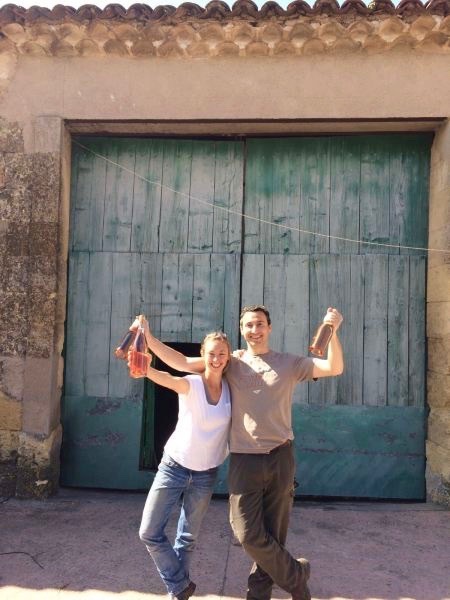 Chloé and Frédéric having a happy moment at Domaine les Serrals in Faugères in the Languedoc. Photo courtesy of Les Serrals. This is a favorite since discovering it last year. The winery is newer; the current owners opened their doors in 2012 and farm organically. They’re located in the village of Cotignac, in the northern part of Coteaux Varois in Provence. Read about their 2016 Rosé here. The grapes are grown specifically for rosé. 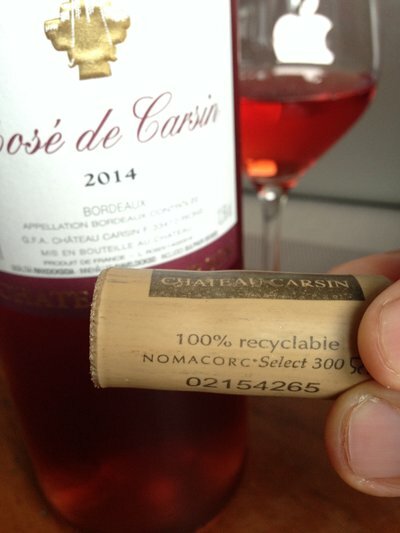 The latest release of Rosé de Carsin is 2017. A deep rose-pink color from Merlot, Malbec and Cabernet Franc. Located in Cadillac Côtes de Bordeaux, Nea Bergland is doing some cool stuff at this Château! She recently started a second label – Charivari Wines. This is her traditional rosé, a delight for aperitif and sipping anytime, or with any foods – fresh and fruity. At just under €10, “cheap and cheerful” according to Nea. A blend of Merlot 43%, Malbec 37%, Cabernet Franc 20%. A subset of vines from these three vineyards are harvested specifically for rosé production. Note: They ship anywhere! Ghislaine Dupeuble makes red, white, and rosé in southern Beaujolais. 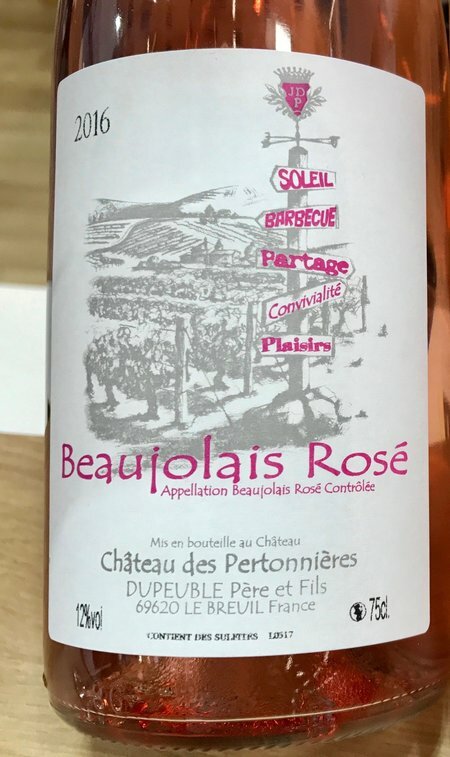 Beaujolais rosé isn’t common and I’m not sure why because the Gamay grape imparts red fruits and tart cherries that will make any day better. I tasted this 100% Gamay last year. Here’s an article about Ghislaine’s “Elle et Beaujolais” group. Her wines are available through Kermit Lynch Wine Merchants. The French #winophiles have a lot of rosé for you this month! Join us on Twitter July 21st at 11 a.m. EDT for a chat using the hashtag #winophiles. Depending on what you’re looking for there’s a rosé for everyone and every budget. Our July #winophiles host Lauren from The Swirling Dervish invites you to join us here. Below are several articles that should tempt your wine palate and persuade you to cook. Heck, you might even decide to hop on a plane to visit France and find your own favorite rosé! And here on Savor the Harvest you’ll find “Obscure French Rosé to Look for Today”. I would have never tried Rose if I didn’t belong to this group and now I can’t get enough. I’m anxious to seek out some of your suggestions. That’s great to hear Wendy! I’ve also been exposed to many wines. Hope you’re able to find some of the rosé I mention here, truly special. I love that you have pointed out the pros and cons to both direct press and saignée. Both can make good wines, depending on the winemaker. It all depends on the intent. And I love that you have featured a rosé made with both methods at once! What great care they seem to take at Domaine les Serrals . And the method of natural fermentation that she uses I just learned about from a winemaker in Oregon. Pied de Cuve , (the method of stomping, the grapes and getting a fermentation started on a small scale first) seems like a perfect way to keep a fermentation natural and to have a backup in case it gets stuck! Thank you for sharing some more obsure wines, these are the little known gems to search out! Glad you liked my article Robin! I can tend to take nose dives when researching and learned there’s much involved when making a rosé-. 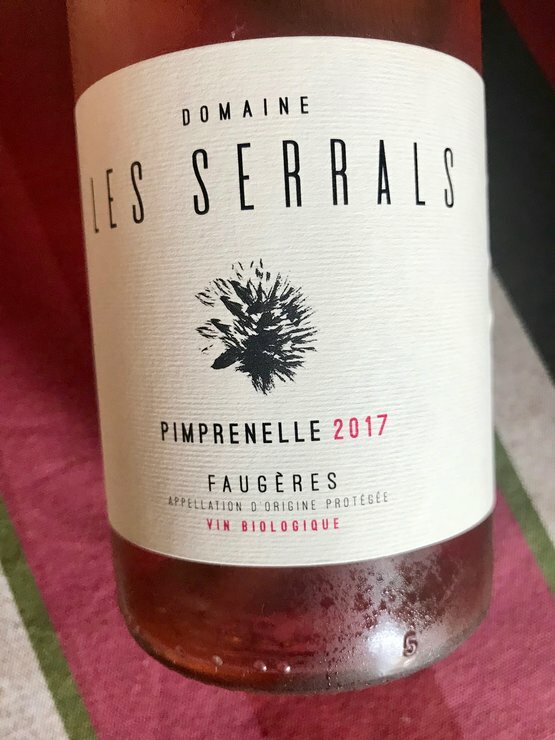 I wasn’t convinced saignée produced nice rosé until I dug, contacted the winemaker if I couldn’t determine how it was made, talked to wine experts and tasted through several. Hope you’re able to find some of these, or others. Interesting “obscure wines” that I will definitely try to find. You are so right, the Gamay grape does seem like a natural for making rosé. Yes It’s dry, fruity goodness! What an array of rosés! I’ll most certainly be looking for some of these! I hope you find them Payal! Nice article. Very informative. Hope to taste some this coming October. Thanks Ed, glad you enjoyed it. October?!? We would love to see you both where ever you land over here! Hope you’re able to find these, and lots more obscure rosé. Yes with raising a glass with you! I’m so jealous of the variety and range of wines that are available to you! Each of the ones you tasted sounds delicious, really reflecting the special place it comes from. Cheers to French rosé! When it comes to French wine, I can order just about anything. I’m thankful to have this adventure in France. Santé! Great post Lynn. I especially appreciate your handling of the Intention v saigneé methods of producing rosé. That’s been my experience. Much seems to depend on the producer, farming terroir, etc. love the sound of that Tannat Rosé! Had a Beaujolais rosé before that was pretty good. Cheers! Thanks Martin. So much goes on behind the scenes from vineyard to bottle. I’ll bet you can find a Tannat based rosé when you’re in France later this year! Great info about the different ways of making rosé, and some good finds! I like the way you’ve gotten off the beaten path with these; I’m pretty sure I’ve never had a rosé form the Basque region, for instance. Thanks David, hope you’re able to find a French Basque / Irouleguy rosé. Tannat makes for bold, slightly savory rosé sip! I agree with Elaine. I don’t think most people would know the difference in how the wine is made in a blind tasting. Well done.